The Ducati Sogno turns out to be another of those designs that seem to be just a little different from everything else out there. In order to pack all those features into such a small space, they had to take a different aproach from the Leica that it looks so much like from the outside. The first unique thing about the Ducati shutter is that it has only one curtain: a single peice of fabric stretches from one drum to the other, with a 20mm wide opening cut out of the middle. Because of this, it can't follow the usual "varying opening/constant speed" approach of most other focal plane shutters; in order to change speeds, it is necessary to change the velocity of the curtain. It does this by placing the shutter speed dial right on top of the takeup drum and attaching one end of the shutter spring to the dial.... as you turn the dial from a slower to a faster speed, you're actually tightening the shutter spring. This creates an unusual pattern in the shutter speed markings, as the distance between 200 and 500 is much greater than it is at the slower speeds, the opposite of the familiar Leica pattern. This isn't enough, though, to provide the full range of speeds from 1/500 down to 1/20; to slow the curtain down at the slowest 1/20 speed, there is an air piston in the bottom of the camera which engages a cam on the bottom of the shutter curtain drum. This delay mechanism is engaged only at the slowest speed. One other major problem is created by the single-curtain approach: on winding the shutter, that 20mm hole goes back past the film again. To solve this problem, the Ducati engineers provided a neat little set of barn doors in front of the shutter, which are linked to the shutter release button: when it's depressed, the doors open, and when the button is released the doors close and cap the shutter. Two other benefits are gained from this aproach: First, if the collapsible lens is not extended, its barrel blocks the movement of the barn doors preventing an accidental unfocused exposure; and second, the lens cap only fits when the lens is retracted, so you can't shoot with the cap on either. 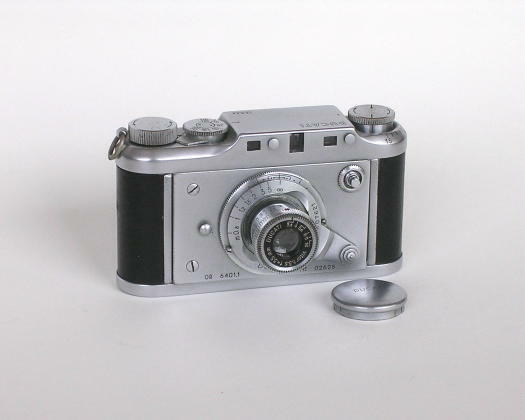 Winding, frame spacing and shutter release are all accomplished by a set of gears at the left hand end of the camera. The shutter takeup drum is geared to the film takeup spool, with the wind knob mounted directly to the top of the film spool (there are no sprockets as in other 35mm cameras). The film winds until the shutter is fully cocked, at which point it can wind no farther. The shutter is prevented from going backwards at this point by the gears tying it to the film spool, and an anti-backup ratchet on the film spool gear. To release the shutter, the shutter release button (once it's finished opening the barn doors) uncouples the gear at the bottom of the shutter drum from the drum itself, and the shutter is free to travel.